Everyday your body produces chemicals that might seem surprising; they are usually thought as poisons or workout supplements, psychedelic drugs or even embalming fluid. Although they might sound strange and harmful but they are extremely important for your body’s functions. In some cases we probably have zero chance of surviving without them. 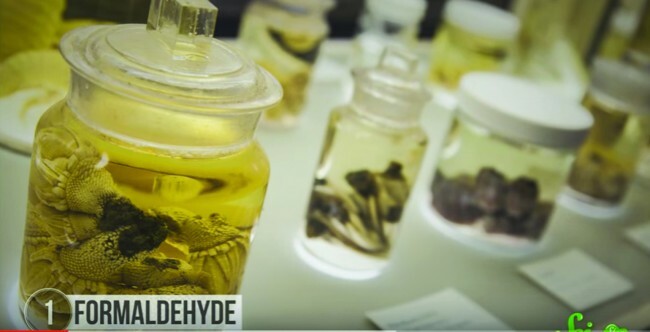 The first one is Formaldehyde, molecule best known for preserving dead things, like animals preserved in tubes or jars or even human corpses. This chemical is great as it locks a lot of cellular components together in a process named fixation. This process stops chemical reactions and makes tissues more rigid, slows down decomposition and kills stray bacteria. Formaldehyde is great at preserving dead bodies that funeral directors keep using it, even though it’s known to cause cancer after prolonged exposure. Although too much of it is bad for your body, you cannot disregard the influence of a small amount of formaldehyde to work properly. Small amounts of acetone are also naturally found in your blood and urine. It is the active ingredient in nail polish remover and paint thinner. It can cause skin rashes at high concentration. When you are desperately in need of energy, your body makes acetone. You now we get energy from carbohydrates but when you exercise and your body is on a low curb diet, it starts breaking down fats and make energy but there is shortage of glucose so a compound called ketone bodies is made which can be further broken down to acetoacetate and acetone. Diabetic patients rely mostly on this compound. Hydrochloric acid is one of the main acids and it can dissolve metals when highly concentrated. The simple compounds like vitamn, glucose our cells se are trapped in more complex molecules. To break down the food and kill the bacteria our stomachs use the power of hydrochloric acids. Its strong enough to break down molecules and even proteins in the cell walls of the stomach. Hypochlorous acid is the active ingredient in a lot of household bleaches. Hypochlorous acid is neutral so it is able to slip right into the defensive wall and start messing with the proteins inside. The white blood cells in your immune system protect your body by seeking out invaders like viruses and bacteria. Then they engulf the intruder and use hypochlorous acid to kill it. Hydrogen peroxide kills whatever it touches. The burst of hydrogen peroxide works as an SOS signal so your body sends platelets and other cells start to block up the wound. It also sends a badge of white blood cells to kill any bacteria. Acid and Ammonia: Citric acid is responsible for that bitter taste in oranges and other citrus fruits. The cells make citric acid as part of the process that turns everything that you eat carbohydrates, proteins and fats into energy and carbon dioxide. Ammonia is a base unlike the other acids. It is used as a fertilizer and in a lot of cleaning products because it’s good at breaking down fats and oils. Body produces ammonia when it metabolizes proteins and so do a lot of bacteria. Some of that ammonia is used in the kidneys, the ammonia bonds to hydrogen which help stop too much acid from building up.